Losing weight, or reaching your optimal weight, can have a profoundly positive impact on your performance. Being lighter with the same fitness improves your power-to-weight ratio, making you more competitive when the road or trail tips skyward. Weight loss improves economy as well, meaning you use less energy to maintain a given pace or effort level. The benefits of weight loss are so coveted that many athletes proactively modify their eating or exercise behaviors in the weeks leading up to a goal event in order to lose a few extra pounds. If you’re one of those athletes, there are some tips on what you should and should not do. Training burns calories, so exercising more while eating less, or nothing at all, is a weight loss strategy many athletes try. Typically this strategy also involves morning workouts before breakfast where you haven’t eaten since the previous evening. The trouble with this is that the quality of the training is sacrificed. Power outputs drop and sustainable paces get slower. You will struggle to recover from these sessions. You may achieve some weight loss, but coupled with the damage you’ve done to the training, you’re not likely to experience the desired improvement in performance. There is some evidence that low to moderate-intensity exercise in a fasted state can help train the body to utilize energy more efficiently, but that type of training is better suited for periods when you are not in the final prep stages for a goal event. In an effort to reduce total daily caloric intake, some athletes try to lose a few quick pounds by skipping breakfast. Of all the meals to skip, this is the worst one. Since yesterday’s workout the body has been working to replenish muscle glycogen stores, repair muscle damage, respond to inflammation, and adapt to the training stress you’ve applied. Plus, overnight you have depleted up to about 80 percent of the glycogen stores in the liver, which is a major source of blood glucose for the brain. It’s not that eating breakfast will increase your metabolism, magically melt pounds off your belly, or reduce overeating later in the day. It’s about supplying the body with the nutrients it needs to continue processes you’ve already started. 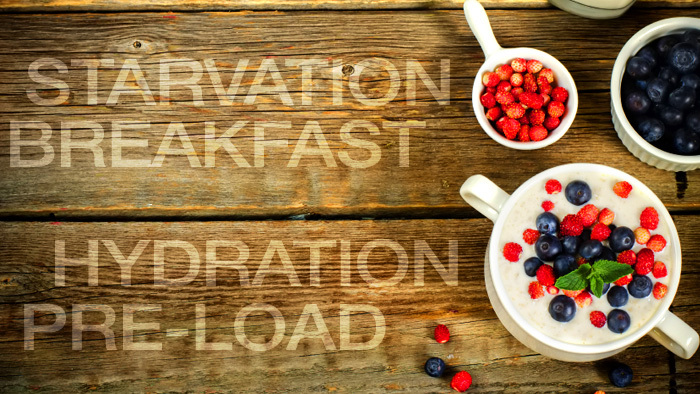 To keep the recovery and adaptation processes going, and to be prepared for good day at work, at school, and in training, don’t skip breakfast. Your weight can fluctuate significantly based on your hydration status. In terms of performance, the worst thing they can do is achieve your weight loss goals through dehydration. You will be lighter, but powerless. You will be lean, but lack the blood plasma volume necessary to control your core temperature and efficiently deliver oxygen to working muscles. Paying extra attention to hydration can be helpful as you try to lose weight, however, because consuming fluids helps you feel full. If you’re having trouble with portion control, try consuming 16 to 20 ounces of water before meals. You’ll go a long way to meeting your hydration needs, and you’ll be less likely to overeat. To take this one step further, try adding a spoonful of psyllium fiber to the water, which will make you feel more full and add some soluble fiber to your diet. In the final few weeks before a goal event, it’s important to prioritize training over weight loss. You can try to lean out a little bit, but you have to be careful not to tank your training in the process. If your race-specific workouts are getting shorter and more intense, as is normally the case leading in to a goal event, remember that if you’re well fed you don’t need to consume calories during workouts up to about 60 to 75 minutes. You have enough muscle glycogen on board to have a great workout. For longer sessions, you will want to fuel normally. If you’re using a power meter on a bike, aim to replenish 20 to 30 percent of your hourly kilojoules. A moderately fit, medium build male cyclist might do 600 kilojoules of work at a moderate aerobic pace, which puts his calorie needs at 120 to 180 calories during this type of ride. When it comes to eating to fuel your training, you want to make sure you have full carbohydrate stores going into hard workouts, but you don’t necessarily need to stuff yourself after them. If you’re doing hard rides on back-to-back days, you have about 24 hours to replenish glycogen stores, and you can do that without increasing portion sizes. If you have 48 hours between workouts, like a Tuesday and Thursday group hammerfest, be careful not to gorge yourself after Tuesday’s ride. You don’t need to reward yourself with a huge post-workout meal when you’re next workout is 48 hours away. A lot of times athletes are able to maintain great habits during the morning and afternoon, and then go off the rails in the evening. A lot of unnecessary calories, especially from alcohol, get consumed between dinner and bedtime, and that can largely undo all your efforts from earlier in the day. Try rethinking your evening, perhaps by pushing your dinner time back an hour. You can also go to bed 30 to 60 minutes earlier than usual, which would be great for your recovery and performance anyway. Both of these strategies are aimed at preventing you from feeling hungry before bedtime, so you’ll be less likely to raid the fridge. Optimal race weight is a balancing act. On one hand you don’t want to carry any more weight than absolutely necessary. On the other hand, every gram of stored carbohydrate in your muscles (glycogen) stores 2 to 3 grams of water with it. Without those you’d be lighter, but weak as a kitten. Similarly, one of the adaptations to exercising in high temperatures is an increase in blood plasma volume. Consuming sodium will also increase blood plasma volume, the watery component of your blood. This will lead to an increase in body weight, but it also improves your ability to maintain core temperature (more fluid available to dissipate heat and produce sweat) and perform at your best. You’ve probably already noticed that there are no dramatic secrets or tricks mentioned above. That’s because in the weeks leading up to a goal event your highest priorities should be to optimize the specificity of your training, get as much rest as you can between workouts, and provide your muscles with the best possible fuels for recovery. The truth is, lighter may be better, but losing a pound or two in the final 10 days before your race won’t improve your performance enough to make up for failures in training, recovery, hydration, or nutrition.